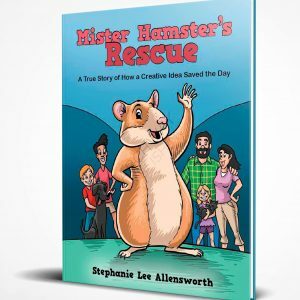 “Drawing from real life experiences with pets and animals is the inspiration for Stephanie’s children picture books. Want to learn more about Stephanie Lee Allensworth’s unique perspective on the world and take a look inside her media interviews? Then, contact Stephanie Lee Allensworth’s team to book her for your next show, conference, meeting, or event. Mister Hamster was a very happy and fluffy tan-and-white hamster who lived in a big cage in a big house with his young caretaker, Ricky. One day, when Ricky was done cleaning Mister Hamster’s cage, he forgot to close the door properly. 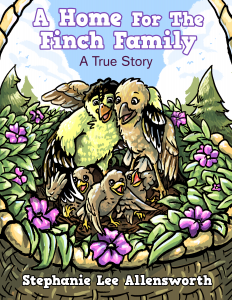 When a strong storm threatens the Finch family home and children, the parents take amazing steps to ensure their protection! After years in the industry as a talent agent, Stephanie decided to break out on her own creating her series REAL PEOPLE. This talk show covers many topics of interest. We started our debut show with the Opioid addiction crisis and have moved into local events, health and wellness, entertainment and more. REAL PEOPLE airs on BCAT16 in Bloomington, MTN in Minneapolis, SPNN in Saint Paul and SWTV in Edina, Minnetonka, Eden Prairie, Hopkins and Richfield. We also are on the web at YouTube.com/AllensworthEnt. I had the privilege of meeting Stephanie a few years ago. She is a delightful person, easy to talk to and about her business. I wish you, Stephanie all success on your “Real People” project. I enjoyed the show! Very informative and necessary. So many times it’s the “real people” who don’t get the recognition. Kudos to you! Denise Joyner 5 Star Facebook Review of Stephanie on Real People with Stephanie Allensworth.